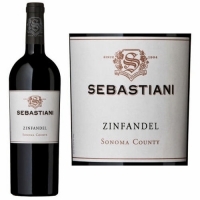 The Zinfandel is deep ruby as you pour it into the glass. Its fruit-forward notes of raspberry and plum are accented by white pepper and vanilla spice. These fruit-forward notes carry through to the palate with juicy flavors of raspberry, wild dark berries and white pepper with a touch of cinnamon. The finish has nice tannins that balance out the lush, berry texture. A joy to drink now, it pairs nicely with a grilled steak or red pasta dish.